Miracle Maker by Covenant Communications. 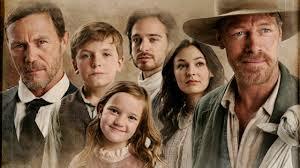 Audience/Genre: For the Whole Family, Historical Fiction, Hope. It all starts with one little seed of love. "The Miracle Maker is coming!" Everyone in the tiny hamlet is excited when they hear the news that the renowned man of wonders is coming to their village. But the humble traveler who appears isn't what anyone expected. They were looking forward to someone magnificent who would change their lives. But it seems this man can barely take care of himself, let alone fulfill the dreams of others. However, miracles can come in all shapes and sizes-and sometimes from unexpected places. 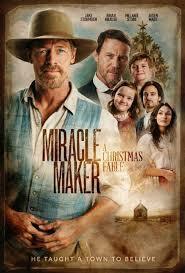 Miracle Maker is a cute, funny, sweet, and endearing historical fiction movie for the whole family. I love the kids in this movie! They are quite entertaining. The movie is set in a time where food and money are scarce. Yet people kept being optimistic about life. In this story, all but one person is optimistic. Mr. Booth owns the town. He lost his wife and his daughter, Lilly, suffered an accident that left a scar on her face and so he is bitter. He is also bitter toward his daughter’s beau, Thomas, who was with her during the accident and Mr. Booth refuses to let her see him anymore. Both she and her beau, the pastor Thomas, are devastated. The town hasn’t seen any snow in forever and the kids want a miracle maker to bring it and hope to their town. There is so much sadness in the town, yet they are all positive about life. So when the miracle maker comes and things start looking up and people’s lives are changed, hope is restored. Things don’t come easily and yet the kids look with wide eyes at this newcomer in the town and follow him like a puppy dog and hang on to what he is doing. The Miracle Maker is not the focus in the movie. This to me is unique in a film. The focus is on all the town folks and what is important to them. They are always giving to others even when they don’t have enough for themselves. And they are mindful of that and give thanks to those that give. The Miracle Maker has little himself and seems to make more with what little he has. And he comes with nothing except a dog, a chicken and a shovel. He takes shelter in a shack not really suitable for living. But he does seem to create a lot with nothing and that is a miracle in itself. I loved the characters. The love story of Thomas and Lilly was so sweet and I wanted them to be together so bad. I was rooting for them. Every character had their own issues and miracle given to them. The soundtrack made the moments that were sweet tip me over the edge and had me cry or laugh all the more at the things that were happening and the joy that was found. The Miracle Maker seemed to touch every single person's life in that small place. You know when you decide to pick what kind of movie you want to go see and then settle in to watch it? You know what mood you are in. Like is it a comedy, a romance, action, etc.? Like you know in Pride and Prejudice is about someone finding love in unexpected places. Marvel Comics presents super heroes saving the day. James Bond is a spy movie. You get the drift. I was given the movie in exchange for an honest review. I had heard good things about it but didn’t really know what it was really about, what point did it make? So, when I got it, I was hoping for some clarification in the beginning but I didn’t get it. Don’t get me wrong, I loved it! I just wanted more understanding in the beginning of what they wanted a miracle maker for. They had little but still seemed relatively happy. Then I saw the changes and understood what a miracle maker would bring. Yet no one asked for these things out right. The only really sad people were Lilly and Thomas. So, if you want a heart warming family movie you will have to check it out!